.....21 And desiring to be fed with the crumbs which fell from the rich man's table: morever the dogs came and licked his sores. .....23 And in hell he lift(ed) up his eyes, being in torments, and seeth Abraham afar off, and Lazarus in his bosom. .....24 And he cried and said, Father Abraham, have mercy on me, and send Lazarus, that he may dip the tip of his finger in water, and cool my tongue; for I am tormented in this flame. .....25 But Abraham said, Son, remember that thou in thy lifetime receivedst thy good things and likewise Lazarus evil things: but now he is comforted, and thou art tormented. .....26 And besides all this, between us and you there is a great gulf fixed - so that they which would pass from hence to you cannot; neither can they pass to us, that would come from thence. .....28 For I have five brethen; that he may testify unto them, lest they also come into this place of torment. .....29 Abraham saith unto him, They have Moses and the prophets: let them hear them. .....30 And he said, Nay, father Abraham: but if one went unto them from the dead, they will repent. .....31 And he said unto him, If they hear not Moses and prophets, neither will they be persuaded, though one rose from the dead. This parable is placed here to show how lepers were regarded in Biblical times. Lazarus ("whom God helps") is another form of the Hebrew name Eleazar. In the Middle Ages, the use of the words Lazaretto and Lazarhouse appear as names for leper hospitals. These hospitals were founded in western Christendom. Lazaroni was used as a term mendicants of Italian towns showing the effect this parable had on people's minds and their speech. 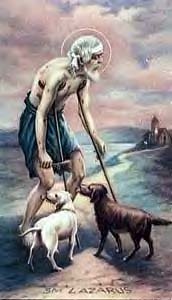 A Lazarone similarly was a beggar in the streets. The Order of Saint Lazarus, though a military order, had one of its objectives as the care of lepers. The Feast Day of St. Lazarus, of the parable, is June 21st. "The Hospitalers, better known under the name of the Knights of Malta, had already reproduced, immediately after the first Crusade, the ancient Order of St. Lazarus, for the care of the sick and the protection of the Pilgrims" (Ratisbone, 123). The Holy Bible (King James version). Cleveland and New York: The World Publishing Company, 93. Smith, L.L.D., William. A Dictionary of the Bible. Atlanta: Thomas Nelson Publishers, 1986, 349. Please note that the Order of St. Lazarus has Lazarus as their patron saint. However, there is a bit of controversy as to whether the "historical" Lazarus, brother of Mary and Martha of Bethany, who was raised from the dead, in the 1st century, by Christ, was a leper,like the Lazarus in the Parable above. The Order of Saint Lazarus celebrates their feast day on December 17th. Lazarus of John 11:1 and 11:5 was the younger brother of Martha and Mary of Bethany. It is assumed, by Biblical scholars, that both men named Lazarus were leperous, since the name has this connotation (as expressed above). The Lazarus that Christ raised from the dead, was said to have traveled to Marseilles (with his famous sisters), after Christ's Ascension, and was the first bishop of that city. (Kelly, Sean & Rosemary Rodgers. Saints Preserve Us. New York: Random House, 1993. Be advised that I have twenty-five(25) "Saint Books" in my library and they are basically undecided on this issue. Many books list them as two separate men with two separate feast days, thus the date stated above this box is for the Lazarus of the Parable.